Peterborough Town skipper David Clarke with the Northants T20 Championship. Photo: Martin Green. 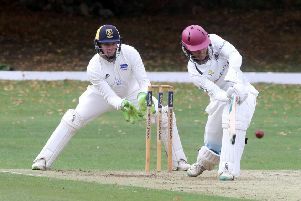 There’s a juicy July of knockout fixtures ahead for Peterborough Town, but skipper David Clarke has warned his players not to take their eye off their bid for the Northants Premier Division title. Town followed their miraculous National Club KO win over High Wycombe with another Super Sunday performance in lifting the Northants T20 Cup at Bretton Gate last weekend after a terrific four-wicket win against holders Old Northamptonians..
Alex Mitchell batting for Peterborough Town against Old Northamptonians. Town now entertain Essex Premier League side Brentwood in a National KO Cup last 16-tie on July 15 and then host a Midlands Regional Finals Day in the national rounds of the T20 on July 29. But Clarke wants his side to tackle those matches from a position of strength in the Premier Division. Town beat a woefully weak Rushton side by nine wickets last weekend to remain in third place ahead of a trip to next-to-bottom Wollaston tomorrow (July 7). “It’s been a brilliant couple of weeks for the club,” Clarke enthused. “We’ve had some great results in cups, but the league remains our bread and butter and it’s important we don’t get distracted by the big games ahead. Jordan Temple batting for Bourne against Market Deeping earlier this season. “The lads have been so good they deserve to play in some glamour ties, but it’s important we keep pace in the league. Rob Sayer will play at Wollaston if he comes through a three-day game for Leicestershire seconds this week and if he’s not required for the first-class county’s T20 side on Sunday (July 8). Younger brother David Sayer is also back, while big-hitting newcomer Ed Alexander is included in a squad which won’t include teenage batsman Kieran Judd. The A15 derby between Bourne and Market Deeping at the Abbey Lawns tomorrow (11.30am) is a battle to stay clear of the relegation places. Both teams are on 99 points, just 11 points clear of the drop zone. Deeping beat Bourne comfortably on the opening day of the season. Ramsey’s home match with title-chasing Saffron Walden is the pick of tomorrow’s Cambs Division One matches (11am). Monday (July 9) sees Bourne take on Stamford Town in the Stamford Charity Cup Final at Market Deeping CC (6pm). Premier Division: Oundle v Geddington, Wollaston v Peterborough Town. Division One: March Town v Kimbolton, Ramsey v Saffron Walden, Sawston & Babraham v Wisbech Town. Division Two: Blunham v Castor, Saffron Walden 2nds v Huntingdon, Stamford v St Ives, Ufford Park v Cambridge Granta 2nds. Eastern Division (11am, three days): Lincolnshire v Cambridgeshire (at Cleethorpes). Division One (1pm): Barnack v Ketton Sports, Bourne v Peterborough Town , Grantham v Kings Keys, Weldon v Wisbech Town. Final (6pm): Stamford Town v Bourne (at Market Deeping CC).